You probably know who I am. Bright pink coat... walking ahead of her two screaming young children on the escalator in Sears. I, on the other hand, can't actually recall a single detail of what you looked like. I was so shocked by what came out of your mouth that the rest of the details are a bit of a blur. But I'm pretty sure that you will remember me. You see... there are all sorts of things about my life that you don't know. And yet, tonight, you nevertheless chose to tear a strip off of me in front of everyone... including my own children. You started in at me while I was walking in front of my children, ignoring their misbehaviour. Perhaps you thought they were misbehaving because I was ignoring them? You don't know that I was ignoring them intentionally. Because giving attention to these kinds of behaviours will actually teach my children to use them more often. You don't know that the reason my children were crying in the first place was because they hadn't been behaving. So after a few warnings, I applied a consequence. We were leaving the mall, as I had told them we could no longer eat at their favourite noodle restaurant. You don't know that my kids were crying because they were trying to get me to change my mind. You don't know that I didn't really want to leave. That I had a couple more errands to run and was also really hungry. You don't know that, regardless, I was holding firm, and we were leaving the mall. So yes, they were crying. But I know that staying to stop them from crying won't ever help improve their behaviour. It will make things worse. You don't know that tonight, I was doing it all right. My kids' therapists would be proud. I am proud. I tried to explain this to you, but you didn't want to hear anything I had to offer. I couldn't get two words in. You just kept yelling at me about how I needed to learn to "control my kids" and how you had your own two children, so you knew what you were talking about. You don't know that both of my children have multiple diagnoses, and that their behavioural challenges are part of these diagnoses. Now, this doesn't mean that I think they can behave however they please. But it certainly makes it likely that you would struggle with them just as much as we do. You don't know that both of my kids have been in regular therapy since they were 2 years, and 6 months of age, respectively. You don't know that we have consulted Occupational therapists, Physical Therapists, Speech-Language Pathologists, Psychologists, Behavioural Consultants, ABA therapists, Psychoeducators and a whole other host of medical professionals in the 4 short years since we became aware of their challenges. You don't know that we are not just letting our children do whatever they please. You don't know that we continue to pay professionals, out of pocket, to help guide us. You don't know that we are doing everything in our power to help our kids learn to manage their emotions in a more socially acceptable manner. But yes, there are still challenges. I thought of trying to explain this to you, but realized that you weren't there to listen or try to understand anyhow. You don't know that my mom and uncle were killed in a car accident a year and a half ago. You don't know that the last year and a half has been the hardest period of my life. Harder than I could have ever imagined. You don't know how challenging and exhausting it has been to raise two children with emotional regulation and behaviour problems when you are entirely drained and depleted yourself. You don't know that I got up each and every day and did it anyhow. You don't know that even on the darkest of days, I have continued taking the kids to therapy, and that we have continued to do our best to provide them with a positive, supportive home environment, where they are loved and appreciated for both their skills and their weaknesses. You don't know that even on days when we feel depleted from the demands of life, we always do the best we can to parent our children. 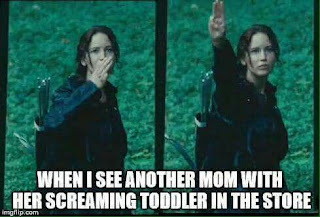 You don't know that just before my kids' meltdown began, an elderly man passed out on the escalator behind me. You don't know that my kids waited patiently for maybe 10 minutes while I helped carry the man to the top of the escalator, with a few other people. You don't know that, in that time, my children learned how to put the needs of a complete stranger before their own. You don't know that they were learning some great life lessons about how to be compassionate and caring, even if it is towards someone you have never met before. You didn't see the looks of concern for this man, etched on my children's faces, as they watched this scene unfold. You don't know that seeing a 2 minute slice of my life is in no way a reflection of who I am as a mother. Tonight I was doing it right. But even if you had seen me while I was doing it all wrong (and yes, we all have these moments), you still do not know, at all, what I am like as a parent. You don't know that my 4 and 6 year old heard and understood everything you said to me tonight. You don't know that they both started crying tonight while eating dinner, asking "mommy, why did that lady say you are a bad mommy when you are a nice mommy?". You don't know that when my son said that you were the bad mommy, I didn't tell him you were, even though I was so tempted. You don't know that I told him that you're not a bad mommy, but that you were probably just having a bad day. Because I refuse to spread hatred and intolerance, and to teach my children that it is ok to make unkind and hurtful remarks about others. I gave you the benefit of the doubt that you couldn't offer to me. You don't know that I will not let you shame me into believing that my children crying is a reflection of me being a bad parent. You donn't know that I will not let you shame my children into believing that they have a bad mother, or that they are bad children because they cannot "learn to stop crying". We sat around the dinner table, once we got home, and discussed how it is not nice to say things that hurt other people's feelings and how even though someone tells you something about yourself, it doesn't mean that it is true, or that you should believe it. My hope is that this will be the first step towards my children learning that they cannot let themselves be defined by how others view them. You don't know that you cannot shake my confidence that I am exactly what my children need as a mother. You donn't know any of these things because you didn't stop to ask. Perhaps, next time, before you denigrate a total stranger, you might want to offer the person a few kind words, ask if they are having a bad day, or if he/she needs any help. Or you could maybe just remind yourself that there might be one or two things about that person's life that you don't know, and choose the route of compassion and caring instead.